Nebraska, South Dakota, and Wyoming. Settler CL has high yield potential, good disease resistance, and goof end-use attributes. 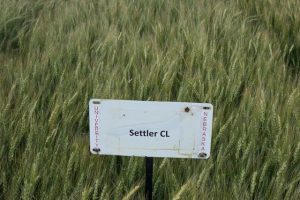 Settler CL is a semi-dwarf hard red winter wheat variety that carries tolerance to the imidazolinone class of herbicides. Settler CL has superior adaptation to rainfed wheat production systems in Nebraska, South Dakota, and Wyoming. Settler CL has high yield potential, good disease resistance, and good end-use attributes.